What kind of music did Napoleon like best? Detail from the Coronation of Napoleon by Jacques-Louis David. 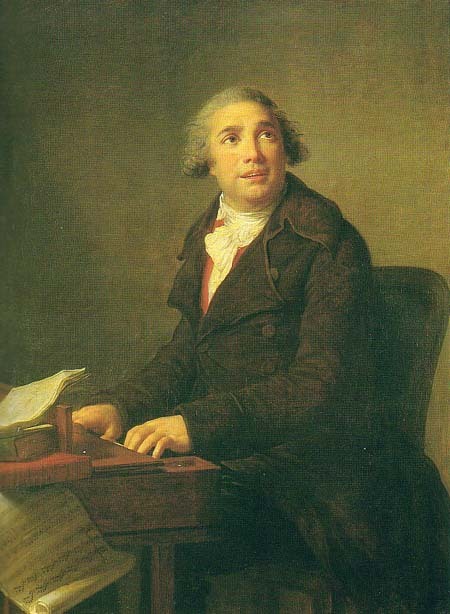 Napoleon’s favourite composer Giovanni Paisiello wrote a mass and Te Deum for the occasion. When Napoleon was in exile on St. Helena, his young friend Betsy Balcombe played and sang “Ye banks and braes” for him. When Paisiello – then chapel master for Ferdinand IV, the King of the Two Sicilies – composed music for the funeral of General Hoche in 1797, Napoleon called him the greatest of contemporary composers. (6) In 1801, Napoleon invited Paisiello to Paris to compose and conduct music for his private orchestra. The 71-year-old was reluctant to leave Naples, but Ferdinand persuaded him to go in the interests of improving Franco-Neapolitan relations. Though Napoleon was pleased, Paisiello’s first French opera, Proserpine, did not please Parisians. Under the pretext that the climate did not suit his wife, Paisiello asked for permission to return to Naples in 1803. There he served as chapel master for Napoleon’s brother Joseph when he was King of Naples, and for Joseph’s successor, Joachim Murat, husband of Napoleon’s sister Caroline. Paisiello composed the mass and Te deum for Napoleon’s 1804 coronation. He wrote numerous religious works for Napoleon’s and Joseph’s chapels. Every year he sent Napoleon a sacred composition for his birthday. He also presented Marie Louise with a song on the occasion of her marriage to Napoleon in 1810. To listen to the kind of music that Napoleon’s soldiers would have heard, visit David Ebsworth’s website. To hear music from Napoleon’s 100 Days (his brief return to the throne after escaping from Elba in 1815), see the University of Warwick’s website. The Napoleon Series website offers a list of Napoleonic and French Revolutionary music available on recordings. J.-G. Prod’homme and Frederick H. Martens, “Napoleon, Music and Musicians,” The Musical Quarterly, Vol. 7, No. 4 (Oct. 1921), p. 584. Louis Constant Wairy, Memoirs of Constant on the Private Life of Napoleon, his Family and his Court, translated by Percy Pinkerton, Vol. 3 (London, 1896), pp. 16-17. Claude-François Méneval, Mémoires pour server à l’histoire de Napoléon Ier depuis 1802 jusqu’à 1815, Vol. 1 (Paris, 1894), pp. 425-426. Lucia Elizabeth Balcombe Abell, Recollections of the Emperor Napoleon, during the First Three Years of His Captivity on the Island of St. Helena (London, 1844), pp. 25-26. 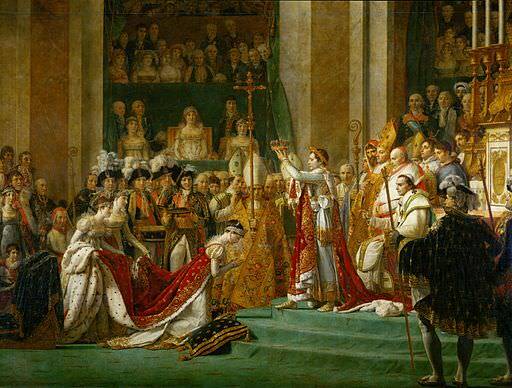 K. Peters, “The Music at the Coronation of Napoleon and Josephine,” Napoleon.org, http://www.napoleon.org/en/reading_room/articles/files/peters_coronation_music.asp, accessed October 2, 2015. “Napoleon, Music and Musicians,” p. 585. Castil-Blaze, L’Opéra-Italien de 1549 à 1856 (Paris, 1856), p. 320. Sutherland Edwards, The Life of Rossini (London, 1869), p. 279. Didn’t Napoleon’s background have some association with Italy? Either his family had been Italian or his native island had, at some point, been associated with Italy? Well remembered, Jim. It’s both. His family was of Italian lineage, and Corsica belonged to the Republic of Genoa until 1768, when the island was sold to France, the year before Napoleon was born. I’m now a Paisiello fan! Thanks, as always, for a fabulous piece of research! Thanks, Dave! I, too, was surprised to learn that Paisiello did “The Barber of Seville” before Rossini. It’s a shame he’s not better known, as he wrote some lovely music. He lived in the age of Haydn, Mozart and Beethoven, and liked Paisiello! What was his theme music when he reviewed the troops? Was it “Salut aux etendards”? It sounds like the sort of thing that would be, but I don’t actually know. Joseph-David Buhl, a gifted trumpeter and the reported composer of “Salut aux étendards,” wrote and published at least twelve collections of military fanfares for trumpets between 1799 and 1829. There’s more about him in this article by Bryan Proksch: http://www.historicbrass.org/portals/0/documents/journal/2008/hbsj_2008_jl01_004_proksch_4349.pdf. Buhl’s “L’Étendard” (which is sometimes called “Salut aux étendards” on YouTube clips) was not adopted by the French army until 1829, 8 years after Napoleon’s death. If you can read French, you might want to check out the Manuel général de musique militaire à l’usage des armées françaises, published in 1848, which is available for free on the Internet Archive: https://archive.org/details/manuelgnraldemu00kastgoog. He expressed a great dislike to French music, which, he said, was almost as bad as the English, and that the Italians were the only people who could produce an opera.